Quality and Regulatory compliance requirements for Medical Device companies are ever increasing and we at Blink Medical are fully focussed on ensuring we meet all relevant standards applicable to our business. 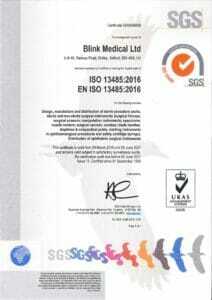 Blink Medical Limited is accredited to ISO13485:2016, the recognised quality standard relating to medical devices, and also the Medical Devices Directive 93/42/EEC. 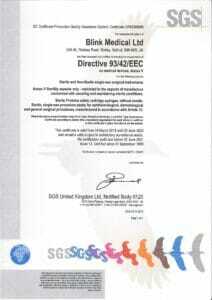 Our Quality Management System ensures continued compliance with the requirements of these standards. If you have experienced a product quality or service issue in relation to our offer you can contact our compliance team directly utilising the link below.